Perhaps the simplest way to measure attachment to religion among people of all ages is to look at the percentage of people who identify with a religious group. 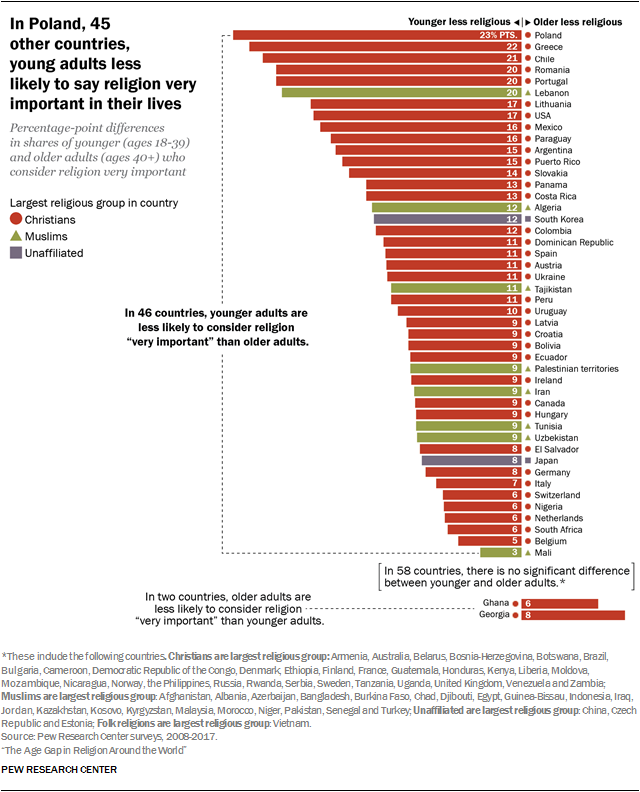 Pew Research Center surveys around the world routinely ask: “What is your present religion, if any?” Respondents are given a country-specific list of potential responses (which generally include several major world religions, as well as “atheist,” “agnostic” or “nothing in particular”). The vast majority of people around the world claim a religious identity, such as Christian, Muslim or Hindu. 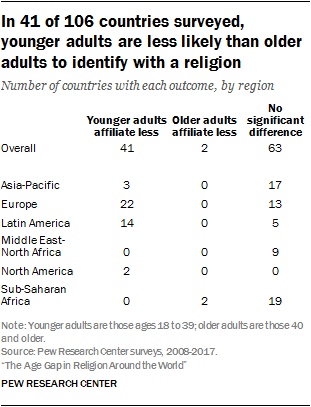 But there is a clear age gap: Out of 106 countries surveyed, young adults are significantly less likely to be affiliated with a religious group in 41. 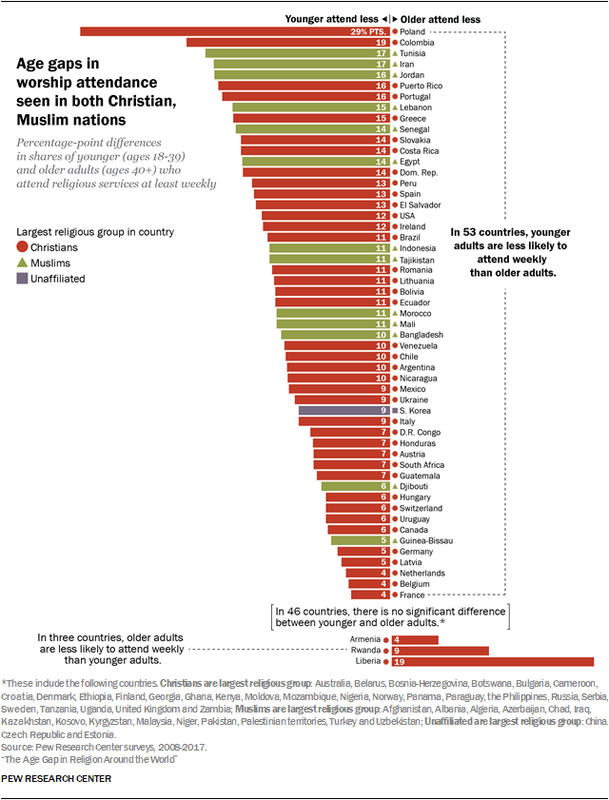 In only two countries are young adults more likely to identify with a religion, while there is no significant difference in 63 countries. Looked at another way, young adults are more likely to be religiously unaffiliated. This is especially true in North America, where in both the U.S. and Canada younger people are less likely to claim a religious identity. (These findings are in line with the rise of the religious “nones” in the U.S., which is being driven largely by high levels of disaffiliation among young generations.) The gap is also prevalent in Europe – in 22 out of 35 countries – and in Latin America, where it applies in 14 out of 19 countries (including Mexico). However, the pattern is not as pronounced in other parts of the world. In the Middle East-North Africa region and sub-Saharan Africa, where most people identify as either Muslim or Christian, there are no countries where young people are less affiliated. 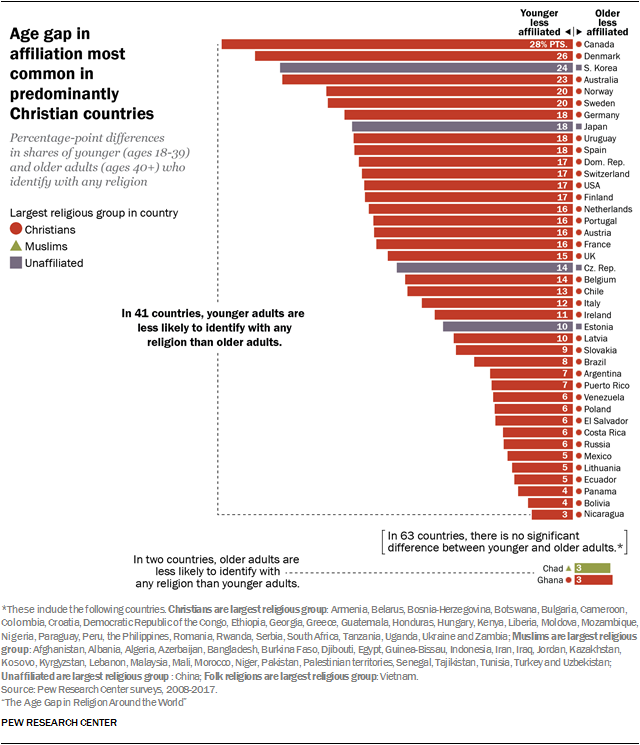 In fact, the only two countries out of a combined 30 in these regions with an affiliation gap are Chad and Ghana, where young adults are more likely than their elders to claim a religious affiliation – making these nations the only exceptions to the prevailing pattern around the world. In the Asia-Pacific region, a religiously diverse area with a wide variety of religious practices, 17 out of 20 countries show no significant contrasts. However, the three nations in that region that do show differences – South Korea, Australia and Japan – have some of the world’s biggest gaps. In South Korea, 39% of younger adults are affiliated with a religious group, compared with 63% of their elders, a difference of 24 points. In Australia, the gap is 23 points (43% vs. 66%), and in Japan it is 18 points (31% vs. 49%). In many other countries in the region, such as Pakistan, India and Indonesia, affiliation is all but universal across both age groups. There is a particularly large gap in religious affiliation – 28 percentage points – in Canada (49% of adults under 40 and 77% of older adults are affiliated). The U.S. differential is smaller, though still considerable at 17 points (66% vs. 83%). In the average country out of 35 in Europe, there is a 10-point difference between the share of younger adults who identify with a religion (75%) and the share of older adults who do (85%), with the Scandinavian countries of Denmark, Norway and Sweden each showing gaps of 20 points or more. In the Latin America-Caribbean region, the average country has a gap of 6 points (87% vs. 93%), with Uruguay and the Dominican Republic exhibiting large differences. Asking people about their affiliation is a basic way to measure a society’s overall attachment to religion. Asking respondents how important religion is in their lives goes one step further, and may be the most direct way to gauge the intensity of that connection. While this question does not directly measure any particular religious practice, it correlates well with more concrete measures – and also has an advantage in that it works equally well across many different religious groups, which is not the case for some specific measures of belief and practice. 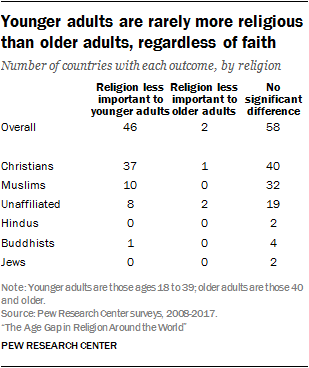 Younger adults in many different parts of the world are less likely than their elders to say that religion is “very important” to them. This is a particularly prevalent theme in Latin America, where age gaps appear in 14 out of 19 countries. It is also common in Europe, where 19 out of 35 countries show significant gaps. The United States and Canada also post larger-than-average differences. There are even significant age gaps in four out of nine countries surveyed in the Middle East-North Africa region, where younger and older adults are almost universally affiliated. In the Asia-Pacific region, there is no significant difference between age groups in 15 out of 20 countries surveyed, although – as on the affiliation question – South Korea and Japan again are among the countries where the young are less religious. 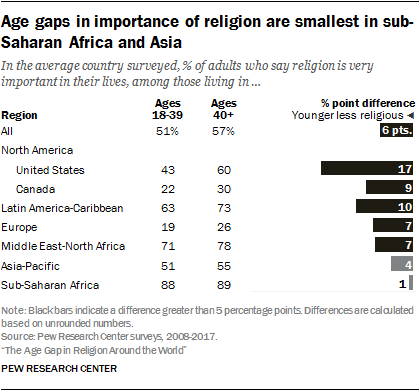 And in sub-Saharan Africa, younger and older adults tend to give similar responses when asked about the importance of religion in most of the 21 countries surveyed. Globally, adults under 40 are less likely to say that religion is very important in their lives in 46 out of 106 nations, while adults who are 40 or older are less likely to say this in only two countries. In 58 countries, there is no significant difference. 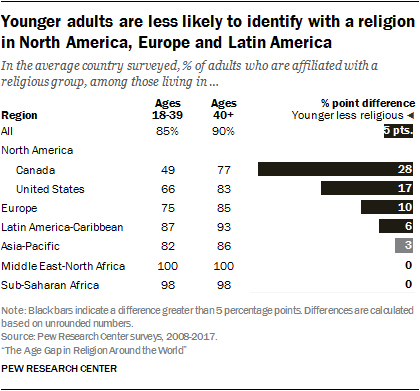 When the national percentages are averaged across all of the countries with available data, younger adults are 6 percentage points less likely than their elders to say religion is “very important” in their lives. In Latin America, the average country has a gap of 10 points. While the average age gap in Europe is somewhat smaller (7 points), the region is home to two of the world’s biggest country-level gaps: Poland, where 16% of adults under 40 and 40% of older people say religion is very important to them, and Greece (41% vs. 63%). There is also a 7-point gap in the average Middle Eastern country, led by Lebanon (20-point gap) and Algeria (12 points). 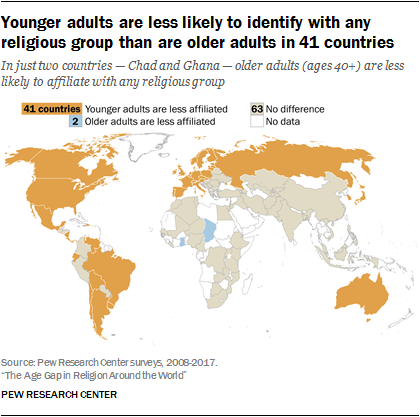 In a couple of countries (Georgia and Ghana), the age gap goes against the global pattern; in these places, young adults are more religious than their elders by this measure. For example, in Ghana – where young adults are also more likely to be affiliated – 91% of younger adults say religion is very important in their lives, compared with 85% of older adults. 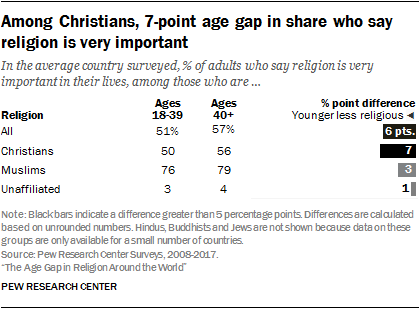 Looking at specific religious groups, half (50%) of younger Christians in the average country – in contrast to 56% of those in the older age group – say religion is very important in their lives. The gap between younger and older Muslims in the average country is 3 percentage points, with 76% of those under 40 and 79% of those ages 40 and older saying that religion is very important. Viewed another way, in roughly half the countries where data are available on Christians (37 out of 78), young Christian adults are significantly less likely than older Christians to say religion is very important to them. Muslims’ responses about the importance of religion in their lives show less of a consistent age gap. Young Muslims in 10 countries surveyed are less likely than their elders to ascribe a high level of importance to religion, while in 32 other countries, there is no significant difference. Young adults are, on the whole, less likely than their elders to say they attend religious services every week. Lower attendance among young adults is especially pervasive in Latin America, where it is seen in 17 out of 19 countries, and in North America, where both the U.S. and Canada show substantial gaps. The pattern also applies to more than half of the countries surveyed in the Middle East-North Africa region and in Europe. 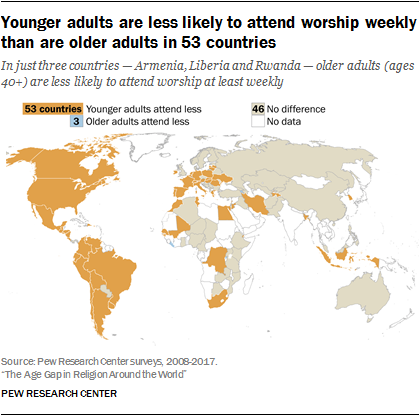 Globally, younger adults are less likely to attend prayer services than their elders in 53 out of 102 countries surveyed, while the opposite is true in just three – Liberia, Rwanda and Armenia. Liberia is a major outlier by this measure; younger Liberians are much more likely than their older compatriots to say they worship at least weekly (85% vs. 66%). One reason for this could be that recent civil wars in Liberia may have affected levels of religious commitment differently among older and younger Liberians (for more on this theory, see sidebar below). In Liberia, younger adults are more likely than older adults to pray every day and attend weekly religious services. These age groups also differ in their affiliations: Younger Liberians are almost exclusively Christian or Muslim (96%), but a considerable minority of Liberians ages 40 and older (29%) identify with an ancestral, animist, tribal or other traditional African religion.19 Liberia has experienced two civil wars within the lifetimes of younger adults, one from 1989 to 1997 and the other from 1999 to 2003. The survey in Liberia was conducted in 2009; all adults under 40 in the survey would have been born after 1969, with most coming of age during wartime. In addition, younger adults in Ghana – where clan-based violence over royal succession killed more than 2,000 people in the early 1990s – are more likely to be affiliated and to say that religion is very important. In Rwanda, where government forces and militias killed over 500,000 people and displaced millions in 1994, younger adults attend religious services more frequently than older adults. And in Chad, which has experienced violent conflicts involving the government, rebel groups and neighboring countries for decades, younger adults are more likely to identify with a religion and pray every day. 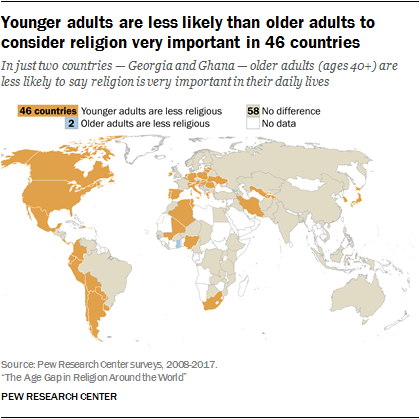 Not all of the examples are in Africa: Younger adults in Georgia say religion is very important to them more often than older adults do. Georgia has experienced a secessionist war in Abkhazia and a conflict with Russia in the past three decades, although the fall of the Soviet Union may also be a factor in religious differences by age. Older adults in Georgia mostly came of age during the Soviet period, when religion was repressed – including by Georgian-born leader Joseph Stalin. At the same time, other countries have experienced conflict during the same period and do not show these types of patterns. In Bosnia-Herzegovina and Israel, for example, any differences in which younger adults may appear more religious are not statistically significant. And, in the Palestinian territories and the Democratic Republic of Congo, younger adults have experienced a great deal of armed conflict but still follow the prevailing global pattern of being less religious than their elders. 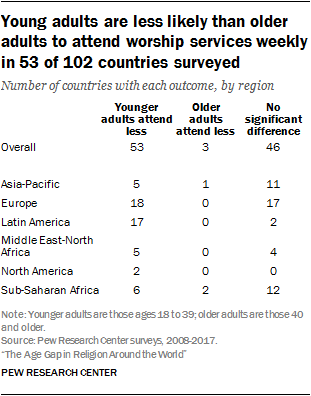 In the average country around the world, adults under 40 are 6 percentage points less likely than older people to say they go to worship services weekly (36% vs. 42%). Again, by this measure, gap sizes vary by region. In sub-Saharan Africa, younger and older adults attend at similarly high rates (averages of 78% and 79%, respectively). But in the average country in the Middle East-North Africa region, just 44% of young adults say they are weekly attenders – well below the 55% average of those ages 40 and older who describe themselves this way. 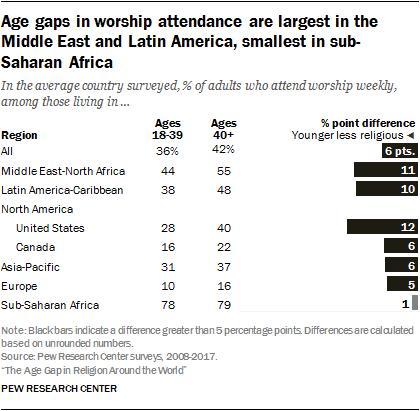 The average country’s age gap in worship attendance in this overwhelmingly Muslim region is similar to the one in the predominantly Christian Latin America region (38% vs. 48%) There also is a 6-point gap in the average country in the religiously diverse Asia-Pacific region (31% vs. 37%). Adults under 40 in Colombia, another predominantly Catholic country, also are much less likely than their elders to go to church regularly. And there are similar patterns in different religious contexts in the Muslim-majority countries of Iran, Jordan and Tunisia. 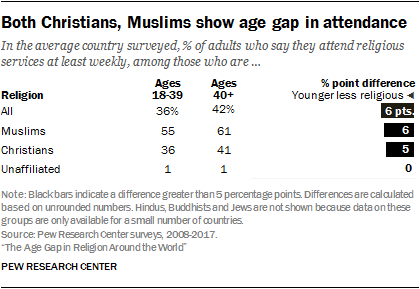 Indeed, at the global level, younger Muslims attend mosque less frequently, on average, than older Muslims, just as younger Christians attend church less often than older Christians. 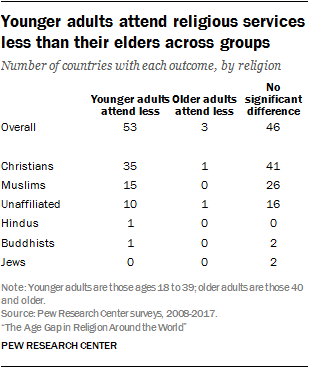 For Hindus, data are only available from the U.S.; the 11-point gap in weekly attendance between older and younger American Hindus is not necessarily representative of Hindus globally, since the vast majority of the world’s Hindus live in India. The generational divide in religious commitment is most apparent when examining daily prayer. Not only is it the measure with the highest number of countries with an age gap, but it is also the measure by which the average country has the biggest gap globally. 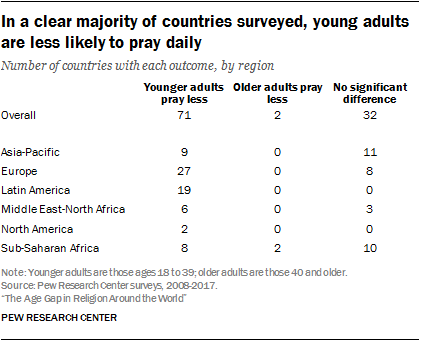 Young adults are less likely to pray daily in all 19 countries surveyed in Latin America, in both the U.S. and Canada, and in 27 out of 35 European countries. Gaps also exist in several countries in the Asia-Pacific region, the Middle East-North Africa region and sub-Saharan Africa. Overall, the pattern holds in 71 out of 105 countries surveyed. In the U.S., 44% of young adults engage in daily prayer, compared with 62% of those ages 40 and older. Canadians in both age groups pray less than their American counterparts, yet they also have a large age gap, with 16% of younger and 30% of older adults praying daily. 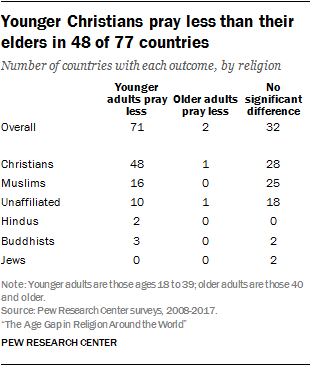 There also are double-digit differences between the average shares of older and younger adults who pray daily in Latin America, the Middle East and Europe. 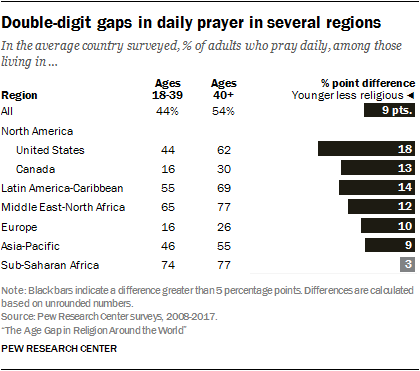 In sub-Saharan Africa, again, the average country’s gap is negligible at 3 percentage points, with high rates of daily prayer among both younger and older adults (74% vs. 77%). 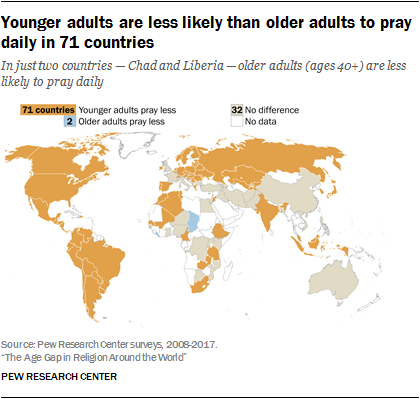 Similar to religious service attendance, Liberia bucks the global pattern – young Liberians are more likely than older Liberians to pray daily. This is also the case in Chad, where young adults also are more likely to be religiously affiliated. Some of the countries with especially large age gaps in daily prayer are highly religious overall, while others are not. For example, in Nicaragua, young adults are 17 percentage points less likely to say they pray daily than older Nicaraguans (67% vs. 83%). Finland has a similarly sized gap of 15 points, even though daily prayer is far less common among Finns in both age groups (8% vs. 23%). An age gap in daily prayer is also found within multiple religious groups. Overall, young Christian adults are less likely to pray daily in 48 countries – a solid majority of the 77 countries with a sufficient sample of Christians to analyze. In the average country, 42% of young Christians pray daily, compared with 51% of older Christians. For Muslims, there is a significant age gap in daily prayer in 16 of 41 countries with data, with an average gap of 7 percentage points across those countries. Among Jews in both the U.S. and Israel, there is no significant age gap in daily prayer, perhaps in part because Orthodox Jews – who tend to have more children – make up a growing share of both Jewish populations, and thus a larger percentage of young Jewish adults. 1. 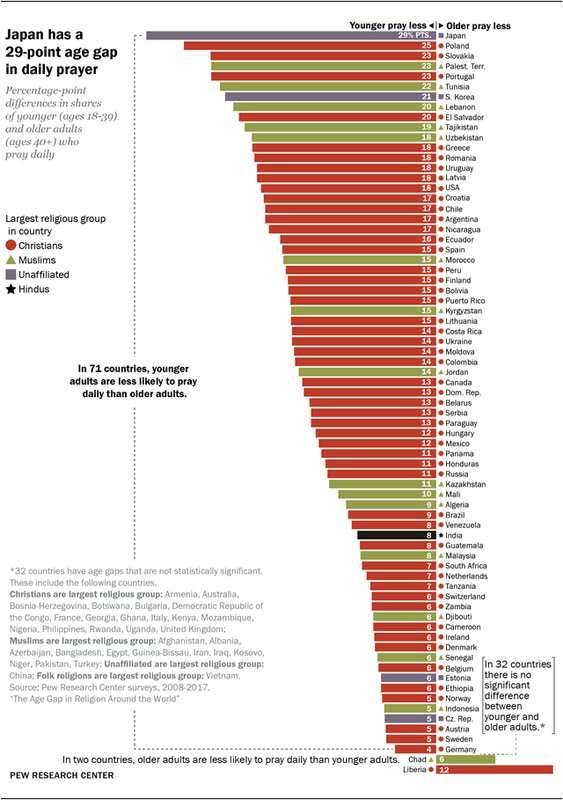 Why do levels of religious observance vary by age and country?